The summer before starting her Business Level 2 course at East Surrey College, Amber undertook an internship as a Personal Assistant in a Human Resources team. This is what affirmed her desire to pursue a career in business, and she enrolled on a Business course at College. After receiving various Apprenticeship offers, Amber chose First Community Health Care, as she wanted to see what job opportunities were available within the business side of the NHS. She commented that “the skills learnt at College really helped me when I was looking for an Apprenticeship” and since starting her Apprenticeship, Amber has been able to develop her communication and workplace skills in a business environment, including minute taking, dealing with complaints and liaising with internal and external stakeholders. She has been offered an 18-month contract and is hoping to progress up to a Level 7 Apprenticeship, equivalent to a Master’s degree qualification. 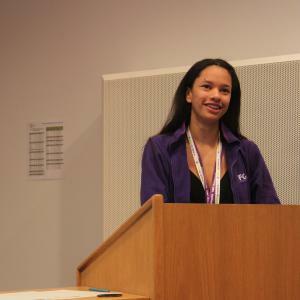 As part of National Apprenticeship Week 2019, Amber returned to the College with her employer to give a presentation on the organisation and shared her Apprenticeship journey with Business and Accounting students!